The BLANCO VISION collection of sinks are proudly made in Canada and have a generous variety of different bowl configurations. VISION sinks are made from patented SILGRANIT material known for its Strength, Durability and Beauty. Exclusive to Blanco, with decades of development and manufacturing expertise, SILGRANIT is Canada's leading coloured sink choice. Proudly made in Canada. The 8 Degree sink is handcrafted from thick, premium quality 16-gauge stainless steel for exceptional durability and universal style. Eight-degree angles on the front and back surfaces give you more space and reduce splashing. The deep, large/medium bowls allow you to keep clean and dirty dishes separate while offering plenty of room for oversize pots and pans. This sink includes a custom-fit wineglass rack, which allows glasses to drip dry into the basin, and two bottom sink racks to help prevent scratches. The distinctive, modern design of the Vault dual-mount sink lends a contemporary vibe to your kitchen. Handcrafted from stainless steel, this sink features tightly angled corners to maximize basin space and lowered divider for freedom of movement between basins. When installed as a top-mount sink, Vault offers a low-profile rim that makes it easier to wipe from the countertop directly into the bowl. An included bottom sink rack fits the large bowl and helps prevent scratches. Whitehaven Undermount Cast Iron 35.6875 inch 0-Hole Double Bowl Kitchen Sink In Biscuit The Whitehaven apron-front kitchen sink features a streamlined and versatile farmhouse style to complement any decor. The Self-Trimming(R) design requires only a simple rough cut, overlapping the cabinet face for beautiful results. 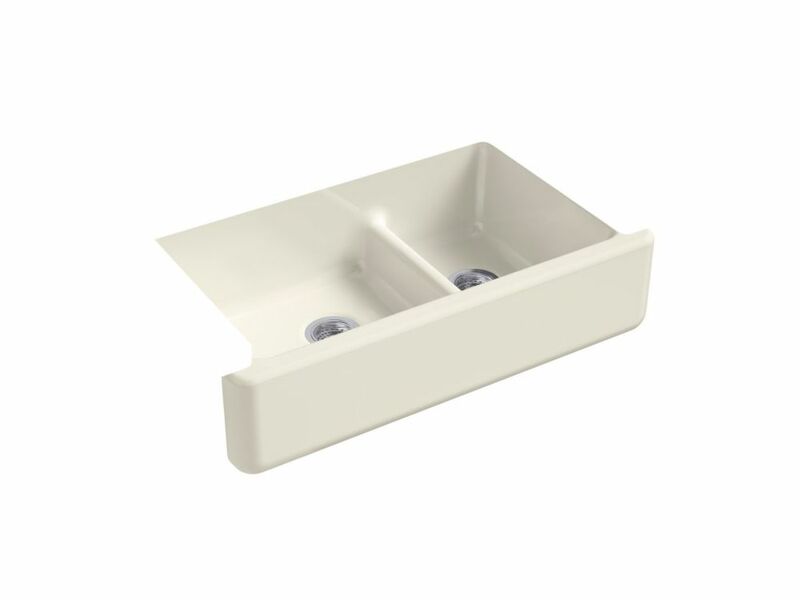 The sink is designed to fit in most standard 36-inch apron-front cabinetry. A low barrier divides the two compartments, making it easy to wash and rinse large items while still keeping the two basins separate. Crafted from enameled cast iron, this sink resists chipping, cracking, or burning for years of beauty and reliable performance. Whitehaven Undermount Cast Iron 35.6875 inch 0-Hole Double Bowl Kitchen Sink In Biscuit is rated 5.0 out of 5 by 1.